We$hop: Fancy (You Already Know), But Why so Expensive? Of course, there’s the kicker: WHY IS WESHOP SO EXPENSIVE? As anyone who ever bought a $12 pound of candy knows, Weshop kills meal points faster than P-Safe kills parties. 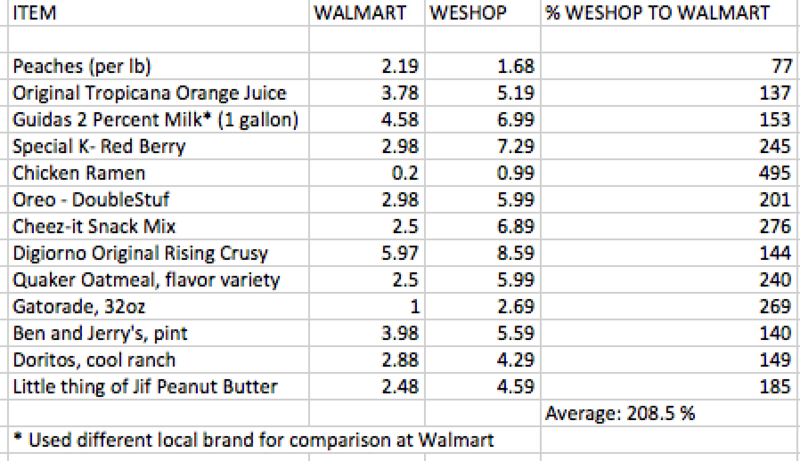 To be sure, I recently did a price comparison of 13 brand name items between Weshop and Walmart (I know, Walmart is an evil giant mega corporation that plots to destroy the world; please stay with me, though), and found that, on average, Weshop charged 208% what Walmart did (chart can be found below). Obviously, there is definitely some sample bias, and some items with extreme price differences drove the average up, but still: What gives? According to Kriksciun, Weshop has to charge higher prices because it cannot buy in bulk like major retailers can, and must purchase items that have already been marked up multiple times. Additionally, local food (yay local!) is more expensive for Weshop to purchase, and thus more expensive for us (boo local!). Weshop actually reduces the markup on local food to make it more affordable. Additionally, trying to provide students with a better experience sometimes comes at the expense of higher prices. Weshop might purchase produce out of season, or reject poor-quality food offered at a low price in favor of something more worthy of our palates, or find other—but slightly more costly—ways of making the shopping experience nicer. The news isn’t all bleak, though: Weshop actually offers an expansive (we’re talking around 30,000 options) order catalogue that actually comes out to be a little cheaper than the in-store products. The store also makes an effort to find items to put on sale, despite the challenges in finding such items. Finally, Kriksciun clarified that any rumor about a tax that goes to Bon Appetit is blatantly false. Moreoever, any discrepancy between what Wesleyan charges for a meal plan and the points we receive is money that actually goes to Wesleyan for padding North College’s coffers maintenance. In the end, then, without looking at Weshop’s financials, it is difficult to tell how much flexibility Bon Appetit has in setting Weshop’s high prices. During my conversation with Kriksciun, he used local bread (at a $2 markup) as an example of a low markup, meaning many items are marked up even higher. Whether such markups are necessary, or extensive, only Bon Appetit may know. However, from my own personal observation, the managers of Weshop and Bon Appetit seem genuinely concerned about making things easy for Wesleyan students, and certainly don’t seem to be purposefully gouging us. They aren’t responsible for the limitations in our meal plan, compared to the price we pay for it. That said, when students are forced to exist on something like 15 points a day (see how many you have here! ), it is virtually impossible to make those points last when groceries are admittedly expensive. One wonders why Wesleyan hires nutritionists when getting three meals a day on a meal plan (plus a healthy snack or two) for the entire semester would require an act of sorcery. But administrators might say that instead of pleading for more points we should probably just be more responsible with them—even if that effectively means eating less. 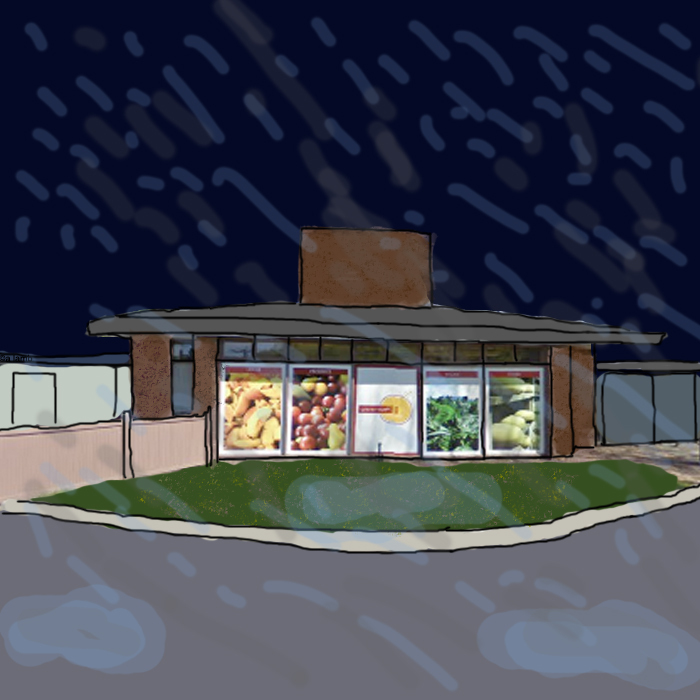 Posted by gordon in Campus Life, Featured, Food and tagged cash cash money, fancy, local food, meal plan, meal points, walmart, weshop on November 9, 2014 at 5:00 PM. I never ran out of points once when i was at Wes. My secret? Sneaking into the Ooze at least 5 nights a week for dinner.